Being a teacher, I'm in full celebration mode now that state testing season is over! I'm sure all my fellow teachers out there can relate in my giant feeling of relief. I feel like an elephant has been lifted off my shoulders!... To honor the end of testing, my network gave us Cinco de Mayo off. Any time I have a 3-day weekend, it leaves me itching to travel! Also since much celebration was in order, I decided it would be the perfect time to go to San Francisco! I have been wanting to visit for the longest time. Being a frugalista, I'm always in search for great deals on flights. After researching, I saw that flights to San Fran were pretty reasonable, so my mind was made up! I was so excited to explore San Fran! The farthest West I've ever gone was Las Vegas, so I was anticipating a fun-filled first trip to Cali. Knowing that California is generally a pretty expensive state, I expected to spend a lot on lodging, which was pretty accurate. Even the Air BNBs were expensive! Everyone knows California is not the cheapest state in America, so that meant finding some great free touristy options. One of the biggest hesitations folks have towards traveling is that "it's so expensive". And I'm here to prove that belief wrong! 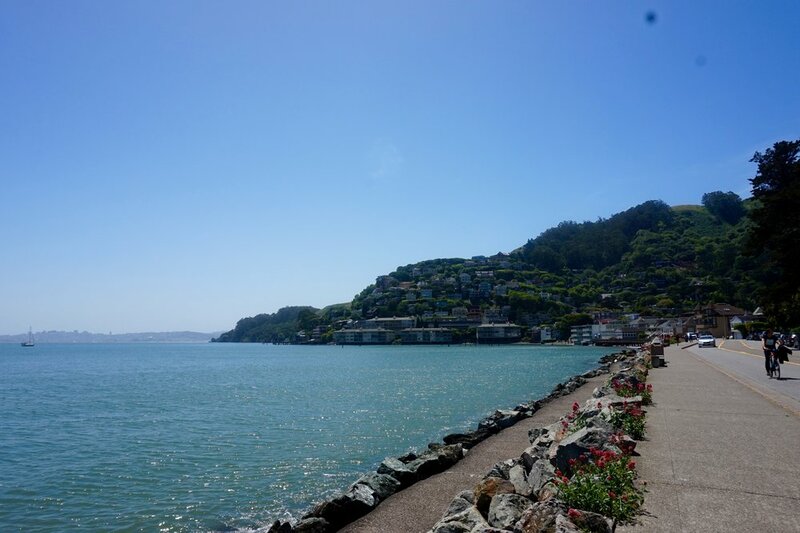 As a frugal chic, I wanted to give you a great list of places to explore in San Francisco at no cost! 1. Drive to the top of Coit Tower! This was a special little find! The drive up to the top was super scenic. The road twisted around the hill to give you great 360 degree views of the city. Once at the top, there a handful of viewing binoculars to see the city from different angles. To go up to the top of the tower was about $8 a person, but you could enter the bottom floor of the tower and take in the scenic views for free. 2. Walk up the 16th Ave. tiled staircase! The beautiful mosaic design is what originally drew me to this destination. The entire staircase is covered with a beautiful mosaic mural. It's absolutely stunning! Of course, we had to walk to the top of the stairs. When we got to the top, we noticed another hilltop with a staircase, so we kept walking! Once at the top, was yet another beautiful view of the entire San Francisco area! Worth the hike. 3. Take a stroll in Golden Gate Park and find the Dutch Windmill! Golden Gate Park is such a gem! It reminds me a lot of Central Park. Hidden fields and beautiful foliage. The Botanical Garden is also located inside! Tons of fun walking trails to explore. One of my favorite discoveries was the Dutch Windmill. It had me feeling like I was transported to Holland! 4. Hike down to the Lands End Labyrinth for amazing views! So I will have to admit the Lands End Labryinth was quite a disappointment. I expected it to be so much larger and grand. Thankfully, the hike down to the ridge was beautiful and gave great views of the coast and Golden Gate Bridge. It was a pretty easy hike and worth it for the coastal views. 5. Relax in Crissy Field! Crissy Field probably offers the best up close views of the Golden Gate Bridge. Another gorgeous area to snap a few photos and relax with a picnic or take a short bike ride. 6. 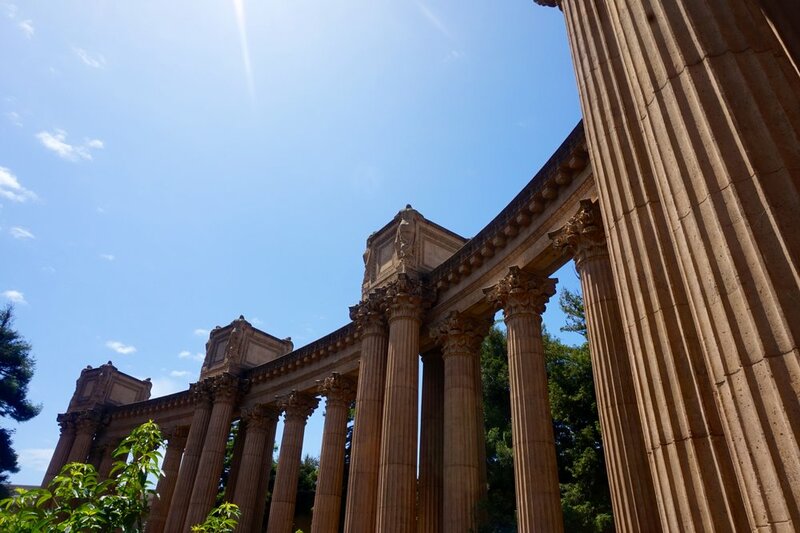 Do a photo shoot at the Palace of Fine Arts Theatre! This place was amazing! It was originally an old bath house. The Roman and Grecian architecture had me feeling like I was transported to a different time. It was simply stunning to walk around and appreciate the intricacies of the architecture. 7. Drive down Lombard St.! This famous San Francisco street is quite a sight! I've never seen anything like it! Not only is the street on a steep decline, it zig zags all the way down the hill. The hill is also beautiful and lush with gorgeous landscaping! 8. People watch on Pier 39 and the Fisherman's Wharf! Pier 39 was a bit too touristy for my taste, but it's a must-do for any San Fran visit. It has your typical touristy stores and restaurants, so you can guess there's a surplus of interesting folks to people watch. :) One thing I did enjoy was grabbing a bowl of clam chowder in a sourdough bread bowl from the famous Boudin's. 9. Grab a free piece of Ghirardelli chocolate at the original factory shop! 10. Take a picture in front of the Painted Ladies! 11. Take in the amazing views at Dolores Park! Dolores Park was really cool, because, like most of San Fran, it is on a hillside. Another great place to relax and take some scenic pictures of the city. 12. 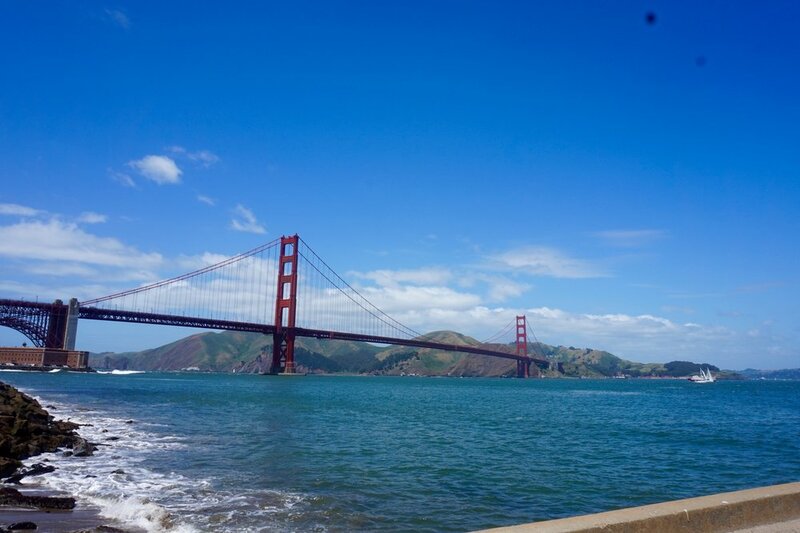 Get up close and personal with the Golden Gate Bridge at Vista Point! My original intent was to visit Kirby Cove campgrounds to get a picture on the Instafamous tree swing. I found out it was a long, pretty rigorous hike out there, so I quickly abandoned that plan. Thanks to the advice of some other fellow hikers, we decided to venture to Vista Point. It was a short hike, but so worth it! At the top of the point you get a really nice up-close view of the Golden Gate. Great for photo ops! 13. Soak in the gorgeous California coastline at the Muir Beach Overlook! Muir Woods is another gorgeous park. Filled with all types of terrain, winding mountains, sweeping evergreens, rocky coastlines, and beautiful Spanish moss. There's also a National Monument inside! The best part of Muir Woods is the overlook! The narrow, winding walk on the coastal cliff was breathtaking! The drive out was beautiful as well. 14. 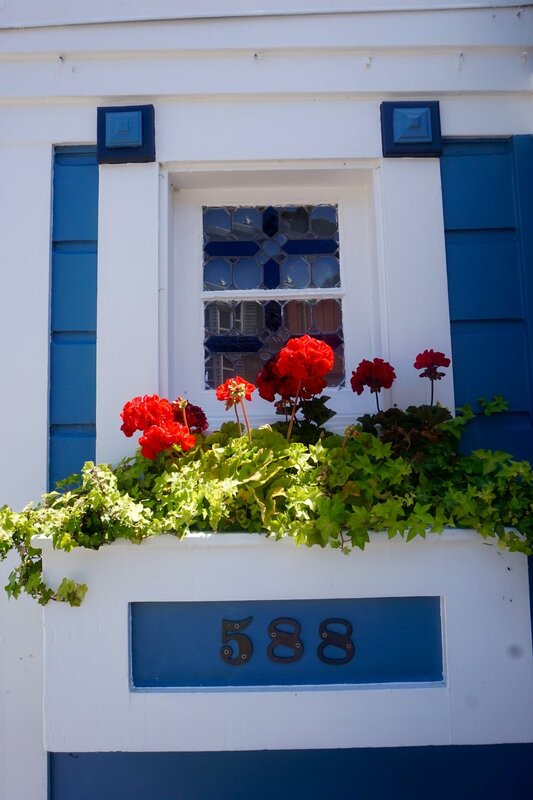 Explore the Mission District, Chinatown, Union Square, and Haight-Ashbury! One of my favorite things about San Fransisco is how unique it is! It reminds me a lot of NYC with its eclectic mix of people and cultures. There are so many cool neighborhoods to explore. One of my favorites was the Haight-Ashbury neighborhood, where the hippy movement began. The hippy vibe is still evident, and there's great little boutiques and restaurants to explore throughout. 15. 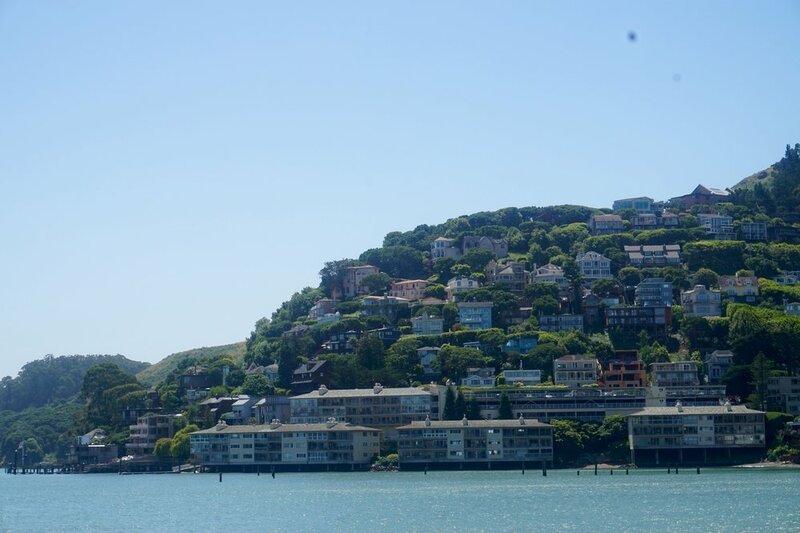 Take a trip to Sausalito, to enjoy the picturesque town! So even though getting to San Francisco and staying there can be kind of pricey, exploring doesn't have to be! There are a ton of great things to explore that won't cost you a penny. I hope you find this list helpful, or at least inspiring to research free options for your next destination!